Singhal N*, Qureshi S**, Gupta AS***. Epidermolysis bullosa (EB) is a group of hereditary skin disorders characterized by blister formation in varying degree of severity and can severely incapacitate the life of the affected person. The severity can range from mild localized disease to widespread devastating process. We report an interesting case of a couple whose 3 out of 4 children were born with Epidermolysis bullosa , two of them died in the neonatal period. This case is reported to highlight this rare disorder and the importance of prenatal diagnosis in couples at risk of recurrence of an inherited disorder. Epidermolysis bullosa is a group of inherited skin disorders characterized by extreme fragility of skin and mucous membrane which lead to the formation of blisters following trivial trauma. As it develops in the area more prone to pressure or friction they are also known as mechanobullous disorder. There are four major types; epidermolysis bullosa simplex, junctional epidermolysis bullosa, dystrophic epidermolysis bullosa, Kindler syndrome. Epidermolysis bullosa simplex(EBS) is most common among them and per se has an incidence of only 10-30 cases per million worldwide. EBS generally manifest at birth or during the neonatal period. 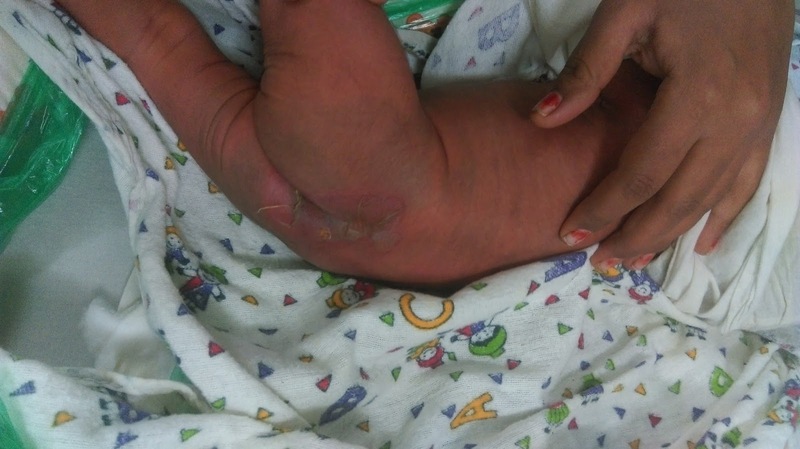 We report a case of Epidermolysis bullosa simplex in a full term baby at birth. A 40 year old patient G4P3L1D2, in a non consanguineous marriage presented at 40 weeks of gestation with the chief complaints of pain in abdomen. The patient was in labor, she progressed and delivered a male child of 2.886 kg, appropriate for gestational age, with apgar score of 9/10. The male neonate had skin lesions at birth. Patient got registered in our antenatal clinicat 13 weeks of gestation. Her menstrual cycles were regular. In her first pregnancy she had delivered a full term male child normally in a hospital. Baby had skin lesions at birth which gradually spread to the whole body involving the mucosa of the oral cavity. Baby got admitted in neonatal intensive care unit (NICU) for the same and died at 2 months of age in NICU due to pneumonia. In her second pregnancy she again delivered a full term male child normally. Baby is 4 years, alive and well and had no skin lesions from birth till date. In her third pregnancy she delivered a full term male child normally. Baby had skin lesions like the first child and was admitted to NICU. Baby died at one month of age due to pneumonia. Patient was referred to Genetic lab and advised genetic counseling but patient did not follow up. She has no other significant medical or surgical illness. Her antenatalprofile was within normal limits. There was no history of any skin disorder in patient’s family but her husband himself had fluid filled lesions at birth which gradually resolved with time. He gave the history of one month NICU stay after which he was discharged. He had skin lesions till 12 years of age which healed by minimal scarring. Now he gives the history of blistering of the skin in trauma prone areas. None of the parents or any member of the extended family of the husband had history of blistering. On examination her vital parameters were stable; there were no lesions on perineum or any other site on the skin. Labor progressed spontaneously and patient delivered a male baby of 2.886 kg, appropriate for gestational age with apgar score of 9/10. At birth baby had superficial erosions of skin on the medial aspect of both right and left ankle. Oral cavity, conjunctiva, cornea, nails, scalp and genitalia were normal. 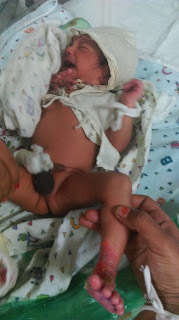 Soft non adhesive dressing was applied and baby was shifted to NICU. In NICU baby sepsis screen was done which was negative. Fresh lesions developed over the buttocks on day 2 of life. Skin reference was done, biopsy that was taken diagnosed epidermolysis bullosa simplex. The neonate was discharged on day 18. Epidermolysis bullosa (EB) is a heterogeneous group of hereditary disorders characterized by extreme fragility of skin and mucous membrane which gives rise to formation of blisters and ulcers following minor trauma. These disorders are associated with wide range of complications from localized skin fragility to neonatal death. There are 4 major types of Epidermolysis bullosa based on the affection of the exact microscopic site that splits resulting in blistering. Out of four types, Epidermolysis bullosa simplex (EBS) is the most common type and has an incidence of 10-30 cases per million. EBS is an autosomal dominant disorder although mode is recessive in some subtypes. In EBS blisters are commonly seen at birth or in the neonatal period. Site of predilection are hand, feet, elbow, knees, legs and scalp. Intraoral lesions can also be present. The blisters typically heal with minimal to no scarring or milia formation and do not result in atrophy of the skin. The complications are secondary infection, sepsis, deformities, anemia, dehydration, skin cancer. Most common cause of death in EBS is sepsis followed by respiratory failure. The propensity to blister formation decreases with age. The diagnosis of Epidermolysis bullosa can be made based on clinical picture of the patient like age of onset ;size, frequency and location of blisters in trauma prone area; family history of blistering and the patient’s geographic and racial ancestry. However absence of affected family does not necessarily mean that the mode of inheritance is autosomal recessive but can be due to spontaneous mutation or incomplete penetrance of an autosomal trait. Skin biopsy helps to diagnose Epidermolysis bullosa. In histology, electron microscopy reveals the abnormal epidermal keratin filaments in epidermolysis bullosa simplex (EBS), abnormal dermal anchoring fibrils in Dystrophic epidermolyis bullosa and defective hemidesmosomes in Junctional Epidermolysis bullosa. Kindler syndrome is added recently as the fourth major type of epidermolysis bullosa with a unique clinical phenotype –photosensitivity. The differential diagnosis includes familial benign pemphigus, toxic epidermal necrolysis, herpes simplex infections, syphilis, and staphylococcal pyoderma. There is presently no definitive cure for EBS. Treatment is supportive and aims to relieve the symptoms. Once blistering has occurred, blister should be punctured with a sterile needle keeping in mind to leave the roof of the blister intact and by covering the affected area with white petroleum impregnated gauze. Open wounds should be covered with non adherent dressing such as petroleum impregnated gauze, hydrogels, fenestrated silicone dressings. Psychological support for parents and family members is vital. Corrective gene therapy is the ideal therapy for EB but the research is still going on before it can be used in clinical practice. In our patient her first and third pregnancies resulted in babies who had skin lesion at birth and died soon after. Second child was normal. In her fourth pregnancy she delivered a baby with skin lesions which was provisionally diagnosed as EBS. We suspect that other two babies also had EBS though no diagnosis was made at that time. Thus, this case report highlights the importance of proper diagnosis as well as preconception and prenatal testing for couples at risk of recurrence of severe inherited skin disorder. Sarkar R, Bansal S, Garg VK. Epidermolysis bullosa: Where do we stand? Indian J Dermatol Venereol Leprol 2011;77:431-8. Fine JD, Johnson LB, Weiner M, Suchindran C. Cause-specific risks of childhood death in inherited epidermolysis bullosa.J Pediatr. 2008 Feb;152(2):276-80. Yiasemides E, Walton J, Marr P, Villanueva EV, Murrell DF. A comparative study between transmission electron microscopy and immunofluorescence mapping in the diagnosis of epidermolysis bullosa. Am J Dermatopathol. 2006 Oct;28(5):387-94.